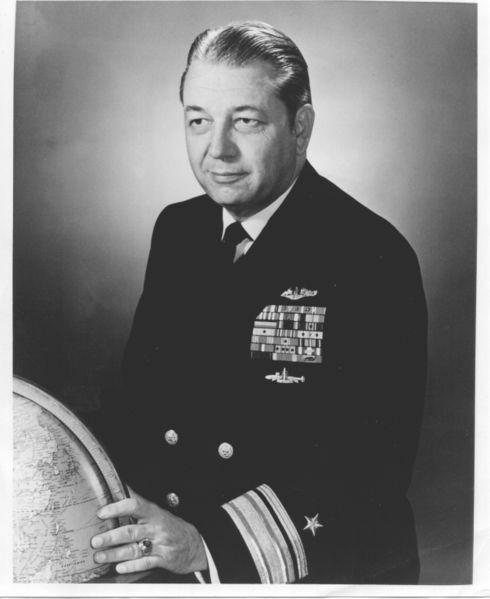 Vice Admiral William Wohlsen Behrens, Jr. was born at Newport, Rhode Island, September 14, 1922, the son of Rear Admiral (then Lieutenant) William W. Behrens and Nellie Vasey Behrens. He graduated from Friends Select Academy in Philadelphia, from Rutherford Preparatory School in Long Beach, California and then from the United States Naval Academy in the class of 1944 (graduated early in June 1943), where he attended via a Presidential appointment. He graduated from the Submarine School, New London, Connecticut, in 1943, and was assigned to the USS. Sandlance (SS 381) as Gunnery Officer, for two war patrols, and was awarded Presidential Unit Citation. He was then assigned to the USS Picuda (SS 382), as a communications and engineer officer, four war patrols, and was awarded Navy Unit Citation, Silver Star, Bronze Star with "V", with personal citations for "conspicuous gallantry and intrepidity". He was credited with conceiving electronic slip rings allowing for continuous, non reversing trainability of submarine sonar; as well as authoring the first short form code for use in submarine wolf pack communications. From July 1946 to August 1948 he was assigned to the USS Quillback (SS 424) as Engineer Officer; from September 1948 to March 1950 to the USS Clamagore (SS 343) as Executive officer, Operations officer and Navigator. He was awarded a Navy "E". He was then the Project officer for the Navy's first underwater telephone (UQC-1) for voice communications between ships and submerged submarines. Then he was project officer for first U.S. scanning sonar (QHB-1). From 1950 to 1952, he was at the U.S. Fleet Sonar School, as an ASW instructor & Officer in Charge in the C Pro-Submarine Sonar instruction section; from 1952 to 1953, he was assigned to the USS Odax (SS 484) as Executive Officer and Navigator, again being awarded a Navy "E"; from 1953 to 1954 he was assigned to the USS Balao (SS 285) as Commanding Officer and received another Navy "E"; from 1954 to 1955, he was assigned to the USS. Harder (SS 568) as Commanding Officer; and in 1955, he was assigned to the U.S. Submarine School as Head of the Engineering Department. He commenced his study of nuclear physics and engineering. From 1955 to 1957, he was Director of the first Nuclear Power School, and acquired a qualified faculty, where he wrote curricula for both officer and enlisted courses and set requirements for operation of nuclear reactors under rigid guidelines later adopted by the Atomic Energy Commission (AEC). From March 1957 to December 1957, he was at the Naval Reactors Branch, AEC, and was Special Advisor to the Chief, Naval Reactors, Admiral Hyman G. Rickover. He the completed nuclear physics study through the doctorate level and qualified as Nuclear Reactor Operator, License Number 5. From 1958 to December 1960, he was assigned to Construction and Commissioning, Command of the USS Skipjack (SSN 585), the first modern submarine (designed from the keel up with improved marine nuclear reactor, fast attack, whale shaped, sail diving planes, high test steel, true submersible). Again he was awarded a Navy "E" and the Navy Unit Citation as well as the Legion of Merit Award for "completion of a mission of great value to the United States." From January 1961 to March 1961 he was at the Guided Missile School, Dam Neck, in the Polaris Command Course. From March 1961 to May 1963 he was assigned to the USS Ethan Allen (SSBN 608) as Commanding Officer (Gold) and again awarded a Navy "E". From 1963 to 1964 he attended the National War College as a student. His dissertation, there was "Nuclear Power for the U.S. Merchant Marine". He also attended George Washington University, where he was awarded an M. A., degree in International Affairs. From August 1964 January 1966 he was OpNav, NATO Nuclear Force Plans, Office of Strategic Plans. He received another Navy Unit Commendation (star for second award) for service aboard the USS Claude V. Ricketts (DDG-5), a NATO multi-national manned ship for "planning to identify NATO nuclear force requirements and in his coordination with participating governments"
In 1966 he was nominated by Secretary of Defense and chosen by the Secretary of State for assignment to the Policy Planning Council, Department of State, with rank of Deputy Assistant Secretary of State with additional duty with the National Security Council staff from January 1966 to August 1967. Additionally, he developed Fish Protein Concentrate and the legislation which was adopted to finance Fish Protein COncentrate factories in Southeast Asia and Latin America with the pilot program in Washington. In June 1967, he selected for promotion to Rear Admiral. From 1967 to 1969, he was assigned to COMPHIBGRU ONE and COM PHIBFORSEVENTH FLT, where he served as Commander (this command was comprised of approximately 65 ships, including two LPH carriers with embarked Marine Landing Force Battalions). In this capacity, he served in 28 Vietnam amphibious operations, including the longest (TET 1968) and the largest (January 1969) with both Army Division and Air Force support flights. He received the Legion of Merit (his 3rd and 4th awards) with Combat V, the Bronze Star with Army Oak Leaf Cluster (second award), and was three times decorated by Vietnamese government with Presidential Unit Citation, Meritorious Unit Citation, Vietnamese Gallantry Cross. In July 1969, he was appointed Director, Politico-Military Policy as was Awarded 4th Legion of Merit. In September l970 he was Oceanographer of the Navy, with collateral duty as Federal Coordinator for Ocean Mapping and Prediction. He then worked on the establishment of the National Oceanic and Atmospheric Agency within the Department of Commerce as well as service on international and on various Oceanographic committees – including the initiation of talks on Law of the Sea, and as a Presidential speechwriter on oceanographic policy. Admiral Behrens was awarded a Doctor of Sciences degree (DSci) by Gettysburg College, Gettysburg, Pennsylvania in 1971. He was the author of U.S. policy: "The Treasure of the Deep Ocean is the Property of all Mankind," and on United Nations environmental committees. For this service he was awarded his 5th Legion of Merit. In 1972 he served as Deputy Administrator of NOAA. An in August 1973, he received medical retirement with 100% disability and was awarded the Distinguished Service Medal and the permanent rank of Vice Admiral, United States Navy. From 1974 to 1975 he worked at J. Watson Noah Associates, Inc., Falls Church, Virginia, as a Corporate Vice President; from 1975 to 1976 at Wheeler Industries, Washington, D.C., as a Science Advisor. In 1975, he co-founded Services National Bank, Arlington, Virginia. In 1976, he was appointed by State of Florida to establish the Florida Institute of Oceanography under the Board of Regents. He acquired a 110’ vessel for conversion to a research ship, refitted a 60’ research vessel and set up the coordinating structure for oceanographic instruction and research at all Florida Universities through the graduate level. He then established guidelines for acquisition of contracts in oceanographic research with cooperative participation by contributing Universities and initiated the oceanographic programs for community colleges and secondary schools, with "at sea" time donated by the University research vessels. As a Professional Engineer (nuclear), he authored many professional articles and journals. He was a member of the Explorers Club New York, New York Yacht Club, Army and Navy Club, Washington, D.C., Army Navy Country Club, Arlington, Virginia, Rotary Club, the Florida Tiger Bay Club, the St. Petersburg Progress Club, among others. Vice Admiral Behrens and Mrs. Behrens, the former Betty Ann Taylor of Tampa, Florida, were the parents of Elizabeth Hunt Behrens Garland of Lexington, Massachusetts, William W. Behrens III of Montville, Maine, Richard Taylor Behrens (deceased), Charles Conrad Behrens of Norwood, Massachusetts, and Susan Taylor Behrens Raker of Amherst, Massachusetts. "A retired US Navy Vice Admiral who served in submarines and who since 1978 had been director of the Florida Institute of Oceanography in St. Petersburg, died of a heart attack on January 21, 1986 at the Bayfront Medical Center in St. Petersburg, Florida. A native of Newport, Rhode Island, he graduated from the United States Naval Academy in 1943. During World War II, he made war patrols aboard submarines. As oceanography became an increasing factor in submarine warfare, he specialized in it. He served as the oceanographer of the United States Navy from 1970 to 1972 and was Assistant Deputy Administrator of the National Oceanographic and Atmospheric Administration when he retired from the Navy in 1974." He is buried in Section 2 of Arlington National Cemetery, among other family members, including his son, Richard Taylor Behrens. Betty Ann Taylor Behrens, age 79, of North Redington Beach, Florida, died Thursday, May 5, 2005 at home. Born in Tampa, Florida, Betty Ann received a BS in chemistry from Duke University, graduating Phi Beta Kappa in 1946. That same year she married William Wohlsen Behrens, Jr., United States Navy. While raising their five children, Betty Ann assisted and supported Bill’s distinguished Naval career from junior submarine officer to nuclear submarine commander to Amphibious Group Commander to Oceanographer to Vice Admiral. After Bill’s retirement as the Navy’s youngest and most decorated three-star Admiral, they relocated to St. Petersburg, Florida, in 1976 where Bill founded the Florida Institute of Oceanography at USF and Betty Ann committed her energies to local charitable organizations. After her husband’s death in 1986, Betty moved to Belfast, Maine to be near grandchildren; then in 2001 to Key West, Florida, where she spearheaded the campaign to create the first assisted living facility in the Keys; and finally in 2004 back to her beloved Redington Beach, her childhood summer home. Betty Ann is survived by her children, Elizabeth B. Garland of Lexington, Massachusetts; William W. Behrens III, of Montville, Maine; Charles C. Behrens of Norwood, Massachusetts; and Susan B. Raker of Amherst, Massachusetts; eight grandchildren; and many nieces and nephews. 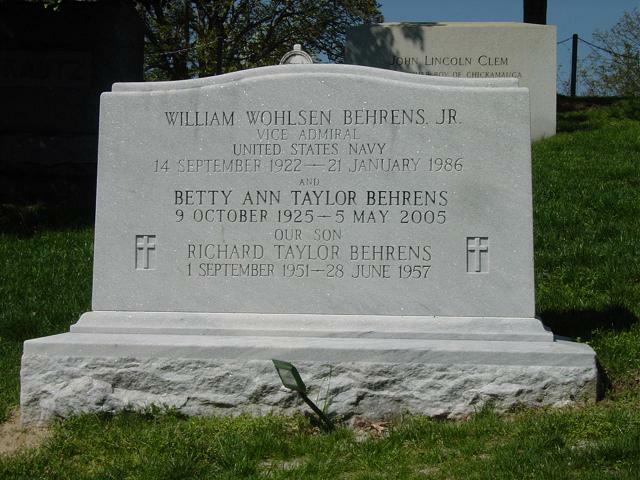 She is predeceased by her husband, Vice Admiral William W. Behrens, Jr., and her son, Richard Taylor Behrens. In lieu of flowers, donations may be made to Navy Relief (www.nmcrs.org), St. Petersburg Free Clinic/We Help (727-823-3471), or a charity or interest that you shared with Betty Ann. Memorial services were held at St. Michael’s Episcopal Church, Arlington, Virginia, on May 26 with interment at Arlington National Cemetery.